Melinda Raker from the charity came to collect the cheque for £432.11 and told us more about the cause. 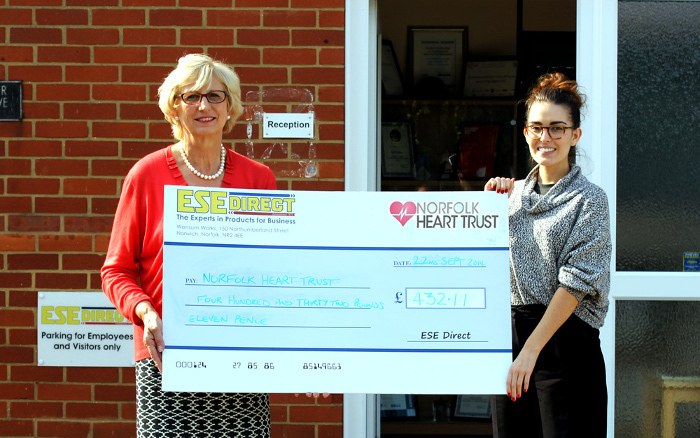 The Norfolk Heart Trust helps many people across Norfolk by raising funds for essential equipment. The “Balloons for Hearts” campaign generated the £1 million needed for specialist x-ray equipment that made coronary Balloon Angioplasty possible at the NNUH’s Cardiology Department instead of patients from Norfolk having to travel to Papworth Hospital. The “Sparks for Hearts” campaign allowed them to offer Cardiac Electrical services too. 4 out of 5 heart scanners and several ECG machines at the NNUH are the result of our fundraising work and the generous cheque from ESE will help us provide more equipment - for example £500 could purchase an ECG Event Recorder for patients to use at home when they get palpitations, dizzy turns etc. You can donate to this great cause by visiting the Norfolk Heart Trust’s donation page.